Khenchen Sherab Zangpo (b. 1963) is a close student and lineage heir of Khenpo Jikmé Phuntsok. In 1995, with the blessing of his root teacher, he established the Tashi Triling Retreat Center, and subsequently its affiliated nursing home and charity hospital, near his birthplace in Derge, Eastern Tibet. Born in 1963 to a nomadic family in Dergé, Khenpo Sherab Zangpo received his Buddhist education at a very young age from several accomplished masters in the region. At the age of 16, he started the formal study and practice of both sutras and tantras. At the age of 21, he received full ordination. In the same year, he went to Larung Gar and became a close student of Khenpo Jigme Phunstok Rinpoche. After receiving his khenpo degree at the age of 24, he started his teaching career at Larung Gar, lecturing students mainly on the five major subjects of Buddhism as well as the Guhyagarbha Tantra. 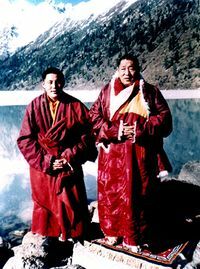 Since 1990 Khenpo has also presided over a number of administrative affairs of the institute. Apart from his Dharma activities in the Tibetan region, he teaches the Dharma around the world, guides group practices and promotes animal lifesaving in both China and overseas. He is also an author of several highly acclaimed books in Chinese language. ↑ In A Marvelous Garland of Rare Gems, Nyoshul Khenpo mentions he is "among the students who maintain [the] lineage [of Khenpo Jikme Phuntsok]". See page 476. This page was last edited on 27 March 2018, at 20:27.